Main IDEA is a weeklong summer arts education program now run out of Clark's Atwood Hall. Worcester Tech student Adhi Murillo earned second place in the Network for Teaching Entrepreneurship (NFTE) New England Regional Youth Entrepreneurship Challenge recently. Network for Teaching Entrepreneurship (NFTE) New England Regional Youth Entrepreneurship Challenge Second Place Winner Adhi Murillo of Worcester Technical High School. Murillo and winner Allison Pereira of New Bedford will represent New England at nationals in October in New York, where they will present and defend their business plans to compete for prizes totaling $20,000. 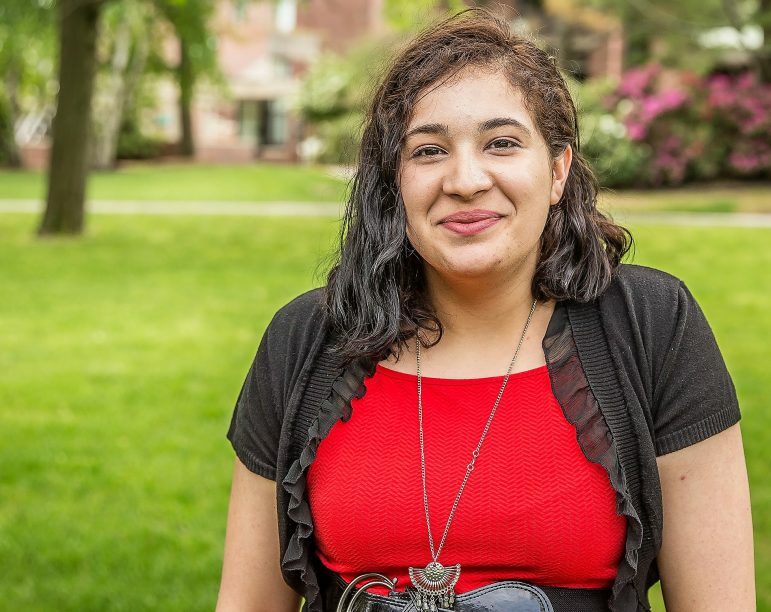 Murillo created Katharoes and won $500 for her plan for an app for on-the-spot cleaning services where customers can request one room or an entire house to be cleaned. Fifty judges participated in the New England competition, including Amy Whitney, director of Innovation & Entrepreneurship Program at Clark University. 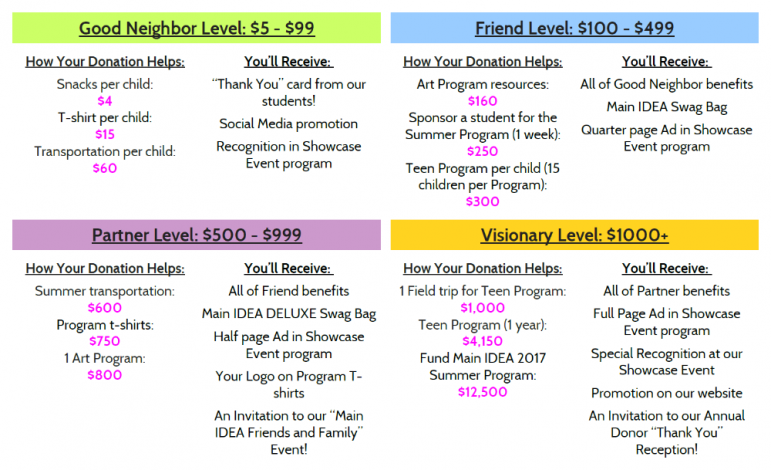 Main IDEA will host its seventh annual Summer Arts Program in August. 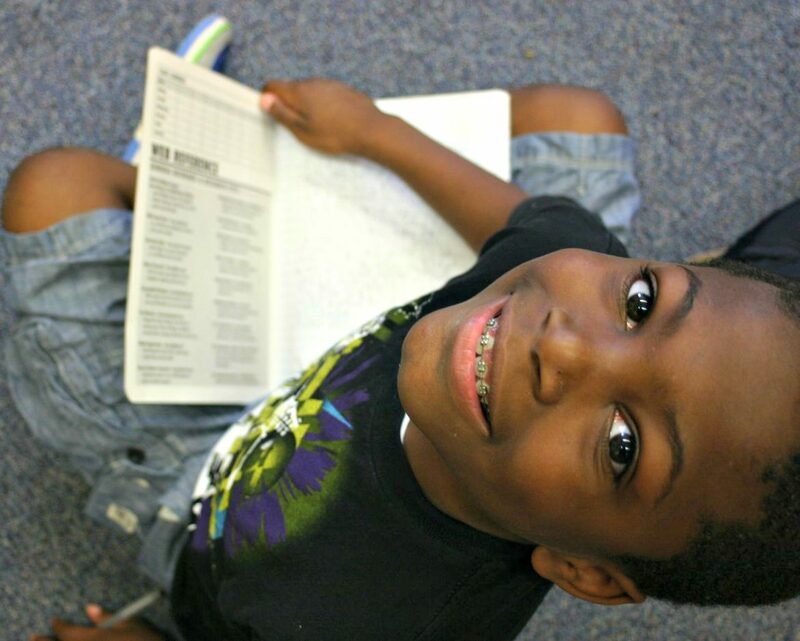 The free one-week program is offered to youth ages 8-12 in the Main South neighborhood. We partner with local artists, businesses and organizations to offer a variety of art disciplines: Music, Creative Drama, Creative Writing, Dance and Visual Art. Main South is one of the most densely populated neighborhoods with the lowest income and highest crime rates in Worcester. Approximately 63 percent of the students from Main South schools we work with are economically disadvantaged, and 59 percent of them are English Language Learners. 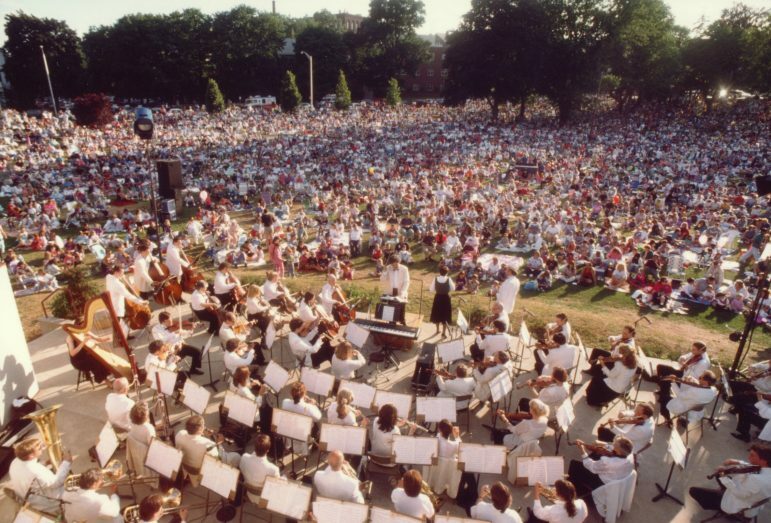 The Massachusetts Symphony Orchestra has announced three free outdoor concerts this summer. At 8 p.m. Friday, June 30, the orchestra will present Worcester’s annual Independence Holiday Concert at Cristoforo Colombo (East) Park on Shrewsbury Street. Conductors will be John Delorey and Jorge Soto. Vocal soloist will be Jane Shivick. Also featured will be the Worcester Kiltie Band. The rain date is Saturday, July 1. A “Salute to Disney”, led by Maestro Myron Romanul, will be 7 p.m. Sunday, July 9, at Institute Park. It will feature a wide-ranging program of Disney classics. Vocal soloist will be Elisabeth Gondek. The rain date is Sunday, July 16. The last concert of the series, 7 p.m. Sunday, July 16, will be “Magically Mozart” and will be conducted by Romanul. The concert will feature works primarily by Wolfgang Amadeus Mozart and his contemporaries. Soloists will be first chair members of the Massachusetts Symphony. Rain date is Sunday, July 23. The concerts will be broadcast by Nick Chase on radio station WCUW-FM (91.3). Concert announcer is Bobbie Chase. For more information on the concert series, call 508-754-1234, or visit the orchestra’s website at www.masymphony.org. The Association for the Advancement of Sustainability in Higher Education recently awarded WPI a gold rating in its Sustainability, Tracking, Assessment, and Rating System (STARS). The rating is a step up from the silver rating WPI earned two years ago and places WPI in a category of select schools that are achieving stellar results with sustainability efforts. Of the 415 participants, one school received a platinum rating, 117 received gold, 201 received silver, 67 received bronze, and 29 received reporter. 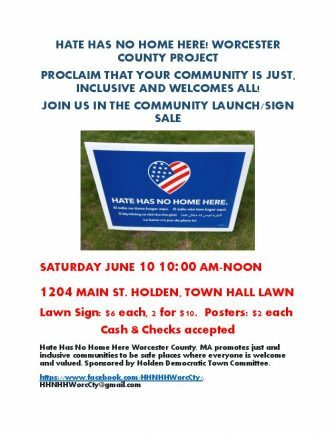 Hate Has No Home Here Worcester County promotes just and inclusive communities where everyone is valued. As part of a nationwide nonpartisan movement HHNHH promotes its message of inclusion through the display of yard signs and posters, creating communities of hope one sign at a time. The “Hate Has No Home Here” sign project began with a group of neighbors from North Park, a Chicago neighborhood characterized by its diversity of age, race, nationality and ethnicity. The phrase used in this poster was imagined by a third grader and kindergartener. “The Holden Democratic Town Committee voted in December 2016 to begin a local campaign and reached out to the Chicago group to discuss logistics and languages most appropriate to Worcester County”, said Karen King, committee member and coordinator of the sign project. Funds were raised to print yard signs and posters in the primary languages that are spoken in Worcester County households: English, Spanish, Portuguese, Vietnamese and French. The Committee included Arabic in its signs. Signs and posters are sold at cost and are not a fundraiser. The public is invited to the project’s launch at 10 a.m. Saturday at Holden Town Hall, 1204 Main St. Yard signs are $6 each, 2 for $10, posters $2. The Committee will provide posters at no cost to area nonprofit organizations and schools in the Wachusett Regional District.